We are anxiously waiting for a letter. Do hope we will get one in the morning to say you are well and safe. We are going to kill a pig tomorrow so we shall have some home made sausage to send you with a roast chicken next week for Christmas. Fondest love and good luck from your ever loving sister Ada. Ada Hodgkinson of Bryn Fynnon Farm, Sychdyn. The extracts are from her letters. 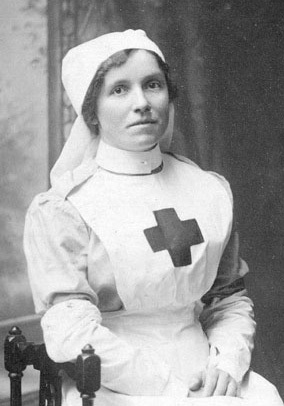 She was a nurse at Leeswood Hall Military Hospital as well as helping run the family farm. We are still anxiously waiting for a letter from you. It is 4 weeks today since we last received a letter and it seems such a long time. I hope you will receive the parcel this Christmas Day which we posted on Friday and that you enjoy the contents. We are unable to make Christmas cake, mincemeat and plum puddings this time because there is not any fruit to be bought. so I hope you will not mind. We will have all the good things when we are all together again. Our thoughts will be with you on Christmas Day. Your Ever Loving Sister Ada. It is my painful duty to inform you that a report has this day been received from The War office notifying the death of 39768 Pt W T Hodgkinson of the SWB which occurred in the field in France on the 21st November 1917. and I am to express to you the sympathy and regret of the Army Council at your loss. The cause of death was ‘killed in action’. 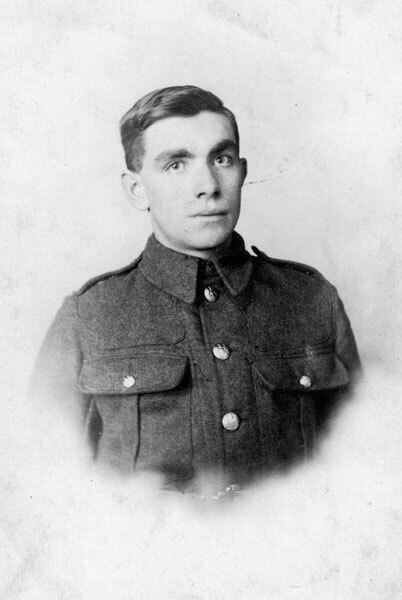 Private 39768 Willie Hodgkinson of The South Wales Borderers. A much loved farmer’s lad who died in France.